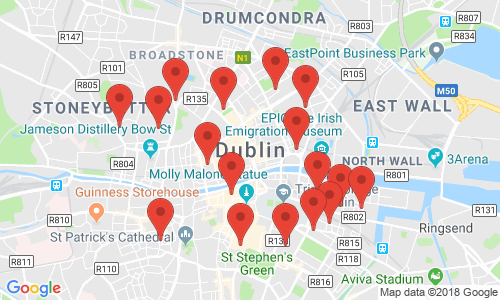 I’ve recently wanted to geocode a large number of addresses (think circa 60k) in Ireland as part of a visualisation of the Irish property market. Geocoding can be simply achieved in R using the geocode() function from the ggmap library. The geocode function uses Googles Geocoding API to turn addresses from text to latitude and longitude pairs very simply. Once it hits the geocoding limit, it patiently waits for Google’s servers to let it proceed. The script pings Google once per hour during the down time to start geocoding again as soon as possible. A temporary file containing the current data state is maintained during the process. Should the script be interrupted, it will start again from the place it left off once any problems with the data /connection has been rectified. Map with google maps static maps API. The R script assumes that you are starting with a database that is contained in a single *.csv file, “input.csv”, where the addresses are contained in the “address” column. Feel free to use/modify to suit your own devices! # Geocoding script for large list of addresses. #define a function that will process googles server responses for us. #if a temp file exists - load it up and count the rows! # Start the geocoding process - address by address. geocode() function takes care of query speed limit. #query the google geocoder - this will pause here if we are over the limit. #append the answer to the results file. Let me know if you find a use for the script, or if you have any suggestions for improvements. Please be aware that it is against the Google Geocoding API terms of service to geocode addresses without displaying them on a Google map. Please see the terms of service for more details on usage restrictions. Hello! I am having some fun getting the query running – I have just gotten stuck when starting the geocoding processes and getting this error. Error: Google now requires an API key. I am beyond new to R and also API’s I am guessing I need to register for a key just don’t know how and where to store it!! Sorry if this is a silly question!! You need to get an API Key (just google “get API key” and steps will come up). Once you have your API Key it is automatically stored on your profile, but you can also copy+paste it into Notepad which you can save as a text file. And you should be good to go. Good luck!